Bird song is one of the most remarkable and impressive sounds in the natural world, and has inspired not only students of natural history, but also great writers, poets and composers. Extensively updated from the first edition, the main thrust of the book is to suggest that the two main functions of song are attracting a mate and defending territory. It shows how this evolutionary pressure has led to the amazing variety and complexity we see in the songs of different species throughout the world. Writing primarily for students and researchers in animal behavior, the authors review over 1000 scientific papers and reveal how scientists are beginning to unravel and understand how and why birds communicate with the elaborate vocalizations we call song. 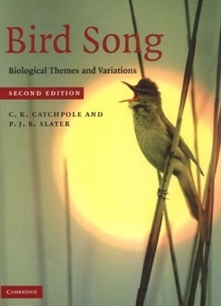 Highly illustrated throughout and written in straightforward language, Bird Song also holds appeal for amateur ornithologists with some knowledge of biology. ► Offers a modern evolutionary and functional interpretation that will enable the reader to understand why bird song is a good model for scientific study. Variation in time and space.